Star Wars games on our consoles and PCs have had a checkered history of quality, ranging from the highs of Knights of the Old Republic to the lows of Masters of Teräs Käsi. 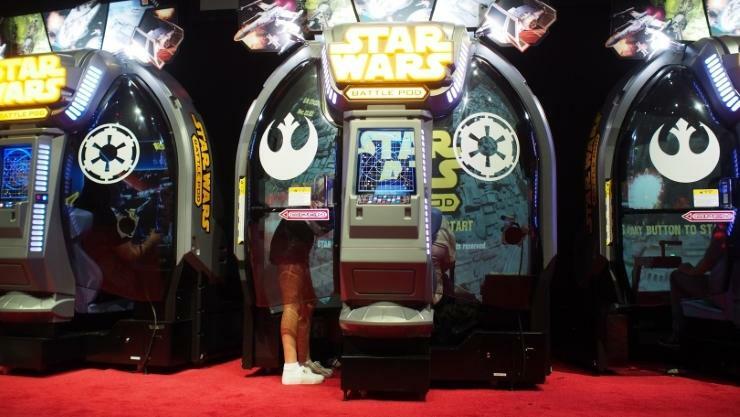 However, the arcade scene has been nothing but solid ever since Atari launched the very first Star Wars arcade back in 1983, all the way to the Star Wars Arcade Trilogy from SEGA in 1998 and Star Wars: Racer Arcade in 2000. Dark smokey rooms with flashing arcades and Star Wars. Can any two things better summarize the early 80s? The dome comes equipped with vibrating seats to simulate explosions and fans that will recreate the feeling of acceleration. Bandai Namco has confirmed you'll be able to fly in an X-Wing through Yavin, a speederbike on the forest moon of Endor, the Millennium Falcon through the Death Star 2, and, of course, a snowspeeder on Hoth. Because what would a Star Wars video game be without tripping up AT-ATs in the Battle of Hoth? You can find the arcades in America on a wide scale from January, but Midtown Dave & Busters in New York City will get them first on Nov. 2.